For literally everything that is in my view right now, there must have been someone who thought first of any of the many, many aspects that go into the making of all of these objects. Only when I turn my head to the left do I see objects for which this does not apply: trees outside. I personally find this aspect of the world very interesting, because even the seemingly simplest solution might have come at the end of an arduous process that possibly entailed many failed attempts to find it. How this general process played out in the world of photography is relatively well known. But still, at times it amazes me, especially when I look at pictures made by people who were very close to the point in time when something was invented. It’s so easy to pick up one’s phone and snap a quick picture now. When I grew up you’d be able to also snap a picture, but to see it there’d be a lot more work involved (yours or someone else’s): someone would have to develop the film etc. Even earlier, there was no such thing as “film” – you’d have to make the equivalent yourself — in a time when there was no electricity. Make no mistake, I’m no romantic. I don’t think the “olden days” were better (they were absolutely not) or more desirable (ditto) or simpler (ditto). I’m simply in awe of the dedication with which some people in the past must have approached the making of, let’s say, a photograph, given that without this dedication there wouldn’t have been a photograph (in contrast, all I need to do to take a photo is to press a button, swipe, and press another button). My own amazement about this dedication is directly tied to my being in awe of the result, with the latter driving the former (the other way around doesn’t necessarily work for me in the arts: craft might make art, but it also might just remain craft). 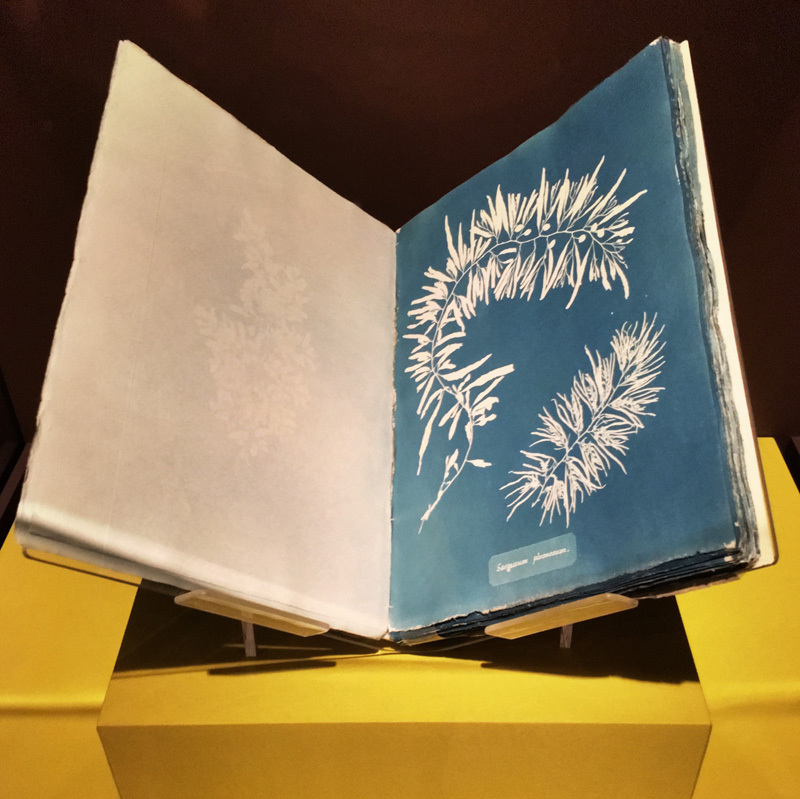 In the world of photography, Anna Atkins‘ cyanotypes of algae clearly belong to these types of images. The process itself was invented in 1842 by Sir John Herschel, and very shortly after, Atkins already used it to make hundreds and hundreds of images, sets of which she gave or sold to other people who, in turn, would have the sheets bound into proper books (so even as a recipient, you had some work to do, assuming you’d want to see what Atkins actually had in mind). A catalog produced at the occasion of an exhibition at the New York Public Library (NYPL), Sun Gardens, now offers deep insight into the artist, both in terms of her life story and the images in question. Turns out, the NYPL owns two copies of Algae books, one — the so-called Herschel copy — acquired in 1985, the other one in 2016. Along with a variety of related material, these copies were put on display in the exhibition co-curated by Joshua Chang and Larry J. Schaaf (the former is curator of photography at the NYPL, the latter wrote the seminal 1985 version of the book which is out of print). Being able to see these books in person for me was one of the highlights of 2018 (beyond the scope of this review, but still: the accompanying exhibition of contemporary artists working with cyanotypes was also very good, even though the quality of the included pieces varied greatly). Sun Gardens demonstrates how the format of the catalog can be used perfectly to bring the material in the exhibition to an audience that might not have had a chance to see it. For example, right after the table of contents and preface, Part I of the Herschel copy is reproduced in its entirety as a facsimile. With the attention to detail that clearly went into this effort — colours and tones were accurately matched, and the catalog’s paper choice is exquisite — the reader/viewer is brought as close as possible to what Herschel would have been able to hold in his hands in 1843. A lavishly illustrated fifty-page section by Schaaf reveals the full story of both the artist and her work, placing her into the societal and scientific context of her time, and diving deeply into the process of making the prints itself. Reading this part had me deeply fascinated — more so, in fact, than looking at many of the actual images. I have the same reaction for various other well-known bodies of work by other artists. For example, I yet have to be able to look through the copy of the Bechers’ water towers book I own. Theirs — much like Atkins’ — is a magnificent achievement, the point of which for me lies in the unfaltering dedication to the subject. Beyond the aforementioned facsimile, Sun Gardens contains a large number of images from the various volumes of Atkins’ books. Consequently, the viewer can experience the variety of material her or himself. There also are more detailed sections on what is known about the books — where they are, where they came from, etc. Plus, there is a section on the process itself, written by Mike Ware, for those who want to know a lot more about it. 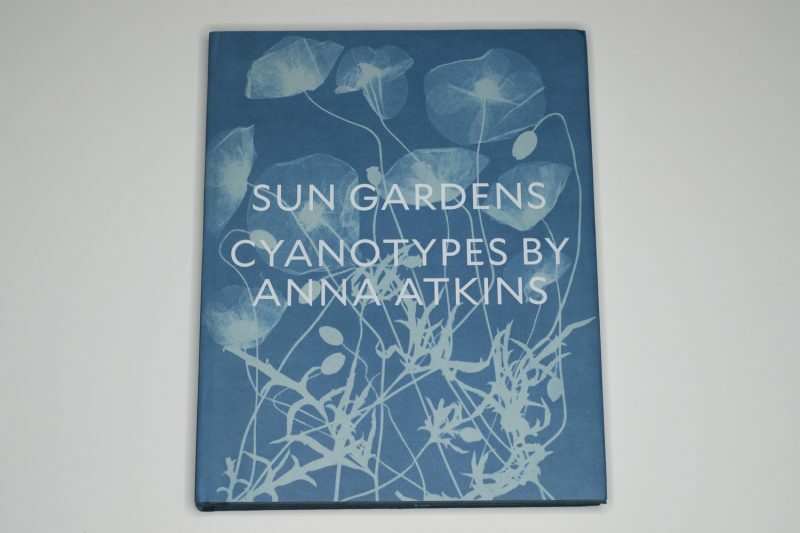 There possibly is no need to stress the importance of Anna Atkins’ work in light of increased efforts to bring to light (pardon the pun) previously underrepresented if not outright ignored efforts by female artists (c.f. my review of How We See). Still, the timing of the release of this catalog is fortuitous. It will hopefully help lay to rest whatever concerns that might still exist about the validity of this work in particular (concerns that I actually never understood — the discussion centering on the camera-less aspect of the work has always seemed positively pointless if not outright petty to me) and about the contribution of women artists to the history of the medium in general.